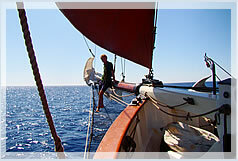 Classic Sailing Trips, Alghero, Sardinia. 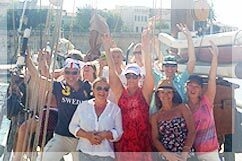 Day Trip Sailing Excursion - Alghero (2 hour evening sailing 'taster' trips are now available, please see details at the bottom of the page). We sail around the spectacular coastline and cliffs of the marine reserve around Alghero's coast, Capo Caccia and Porto Conte Bay. Itinerary May to October inclusive (may vary slightly depending on prevailing weather conditions). 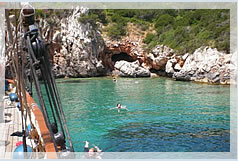 April Itinerary is similar but departure is 10:30 and arrival back in Alghero is 16:00. 12.45pm Lunch, refreshments (including local wines and beer) served. Please note bottled water is available all day free of charge and alcohol is not served until lunchtime. 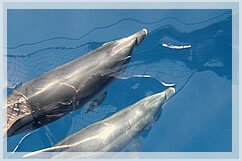 For safety reasons we stop serving alcohol once the boat is on the return journey to Alghero. Typical Lunch - We buy fresh, local produce daily from the local bakery and delicatessen. We can cater for special dietary requirements. Please let us know when booking your trip. Refreshments Tea and coffee served, Fresh Fruits to follow. 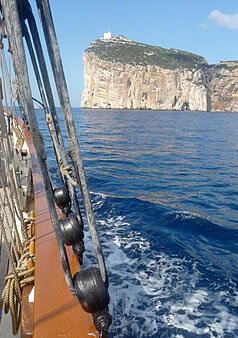 From Easter until mid May we offer a 2 hour 'taster' sail which leaves Alghero at approx.17.00 and returns around 19.00.